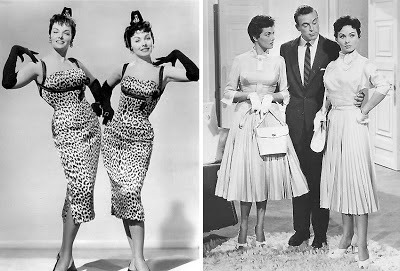 The sequel to Anita Loos Gentlemen Prefer Blondes was originally titled But Gentlemen Marry Brunettes was shortened to make it seem like a sequel to their 1953 hit. 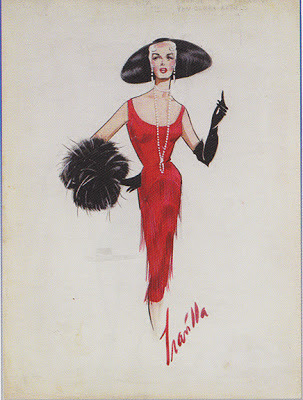 Along with Jane Russell, Fox brought back Jack Cole for choreography and Travilla for the costumes. 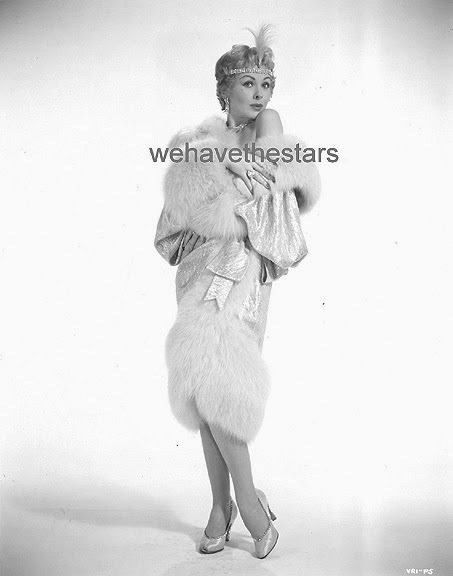 Jeanne Craine would co-star with Russell in place of Marilyn Monroe who was now the studio's top-grossing actress. The plot would seem a simple one: Two Broadway showgirls and siblings Connie and Bonnie Jones, are sick and tired of not getting anywhere in their careers in New York City except for bottom-rung jobs. 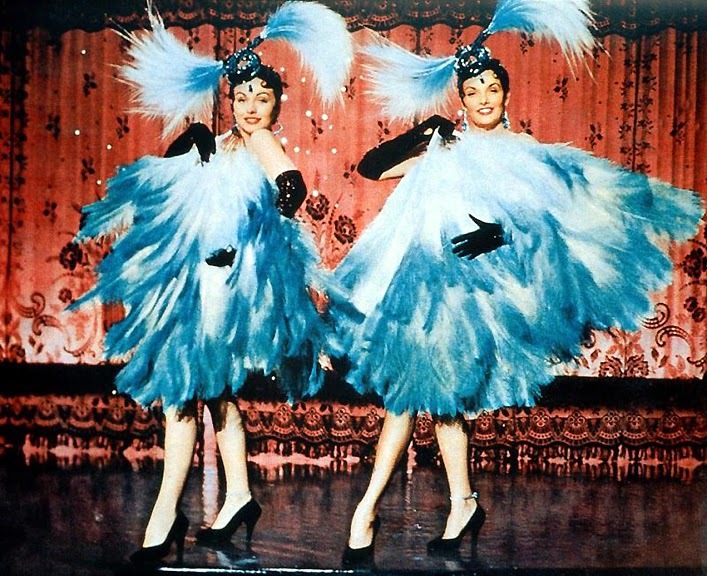 Quitting Broadway, the sisters decided to travel to Paris to escape their bothersome boyfriends and take the city by storm which their mother and aunt (Mitzi and Mimi Jones) had done back in the 1920s. 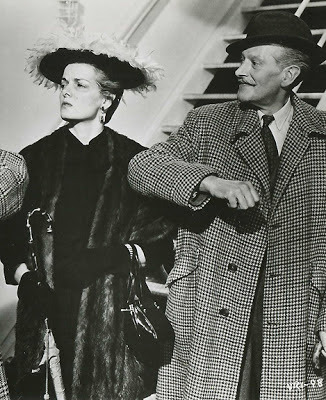 This allowed both actresses to play duel roles and the opportunity for Travilla to reach back into his childhood and his aunt Sybil's memories of the industry. Russell (Bonnie) and Craine (Connie) as Shriner party girls in leopard and with co-star Scott Brady upon their arrival in Paris. Sexpots to school marms. Travilla's concept for Mitzi and Mimi and the finished product. 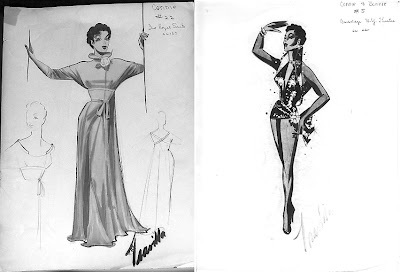 Xerox copies of Travilla designs for Russell and Craine purchased on ebay from a seller who found them in a box of artist supplies. 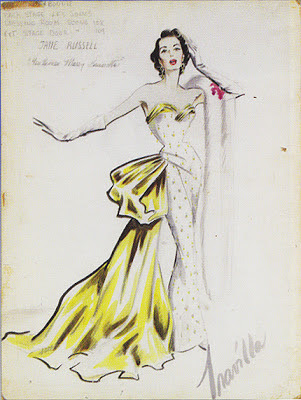 Possibly used for figure study or fashion design from a Los Angeles-based school. Bright red "shimmy" with black gloves and feathered muff. Two designs for Craine. 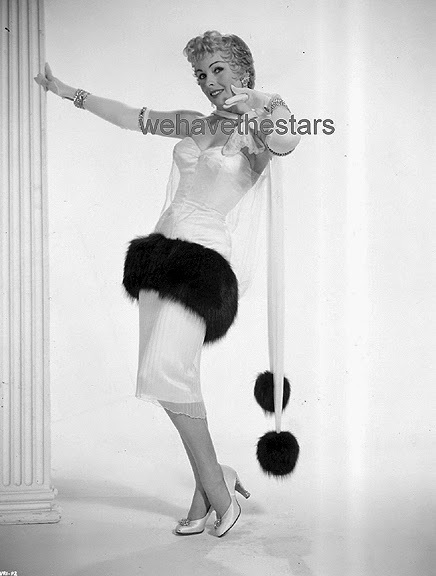 Demure robe and high-cut show costume. Craine and Russell in matching lingerie. 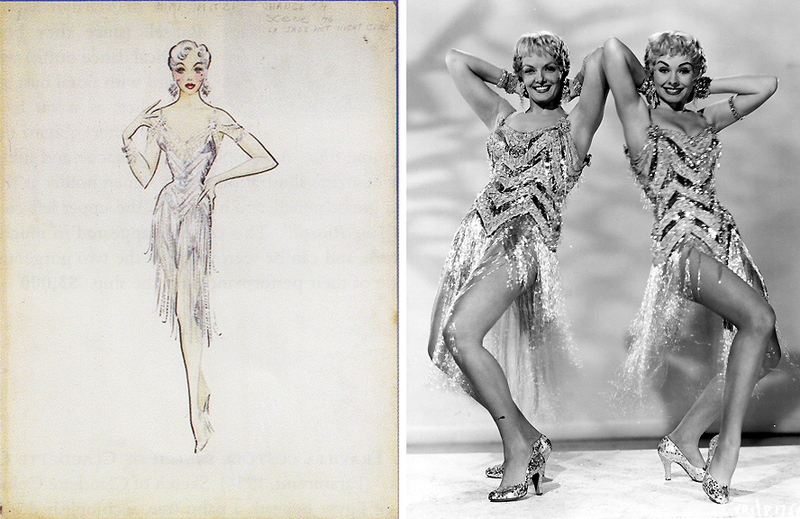 Russell's sketch is more onscreen version than Craine's. Notice similar body position for all three. Though Christian Dior designed the gowns used in the fashion sequence, Travilla's creations rivaled the Frenchman's in every way. Russell was "aged" to play Mama Mimi Jones coming to rescue her girls from a life of heartache.